The Aras River forms the southern boundary of the Caucasus. The river originates in eastern Turkey, and serves a large part of its course as a border river: consecutively between Turkey and Armenia, Turkey and Azerbaijan (the exclave of Nakhichevan), Iran and Azerbaijan (the exclave of Nakhichevan), Iran and Armenia, Iran and Nagorno-Karabakh (the area belongs formally to Azerbaijan, but de facto it is an independent republic), and then again Iran and Azerbaijan. All in all, an important border area in an unstable region. 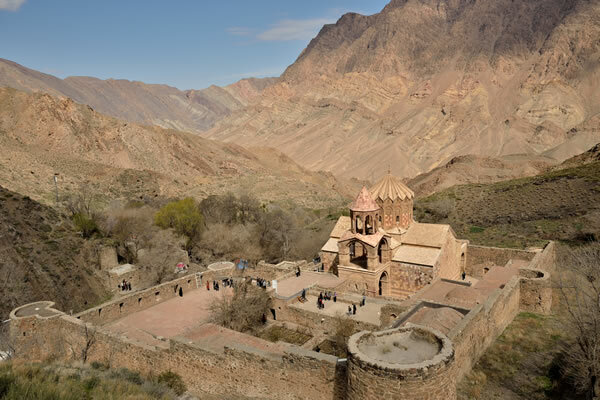 This important role as a border river exists only since 1813, when the Russian- Persian war led to the giving up of the Persian territory north of the river by the Persian Empire. We drive at first along the river that separates Iran from Nagorno-Karabakh. The contrast between the two sides of the river is huge. 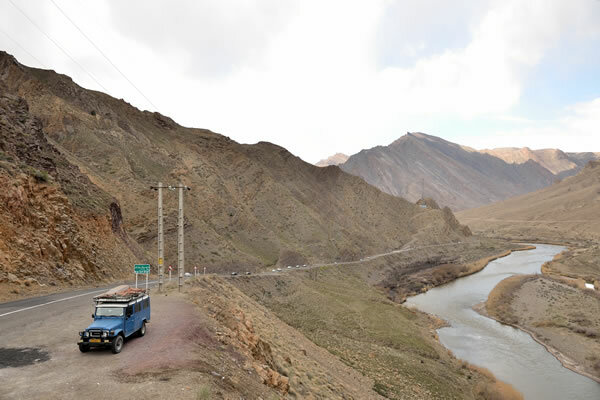 On the Iranian side, the side where we are driving, it is bustling with Iranian tourists who frequent picnic at the river bank during their No Ruz (Iranian New Year) holiday. The road is in good condition and the villages through which we drive, are well developed. If we look to the right and to focus on the situation on the other side of the river, we see the effects of years of war between Armenia and Azerbaijan over the region called Nagorno-Karabakh. Bombed and abandoned villages, collapsed train tunnels and a visible presence of military posts are silent witnesses of the misery that happened here during the Nagorno-Karabakh war. It is 20 years since the ceasefire agreement between the warring parties, but officially the two countries, Armenia and Azerbaijan, are still at war. 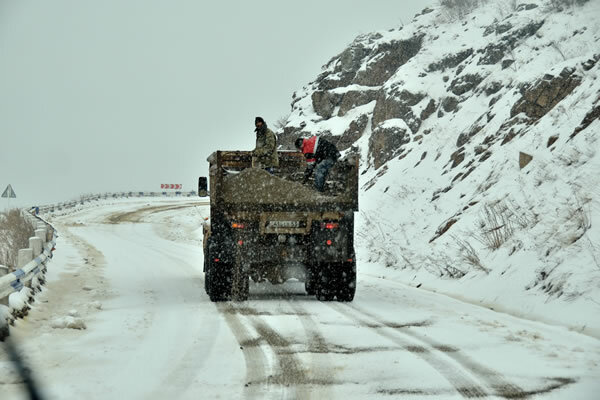 We have decided to cross the Iranian-Armenian border to start our trip through the Caucasus. There is a border post between the two countries (at the Nordooz settlement on the Iranian side and the Armenian village of Agarak on the other side). The border terminal on the Iranian side looks fine with a modern passenger terminal in which a cafeteria, several exchange offices and the immigration desks are located. 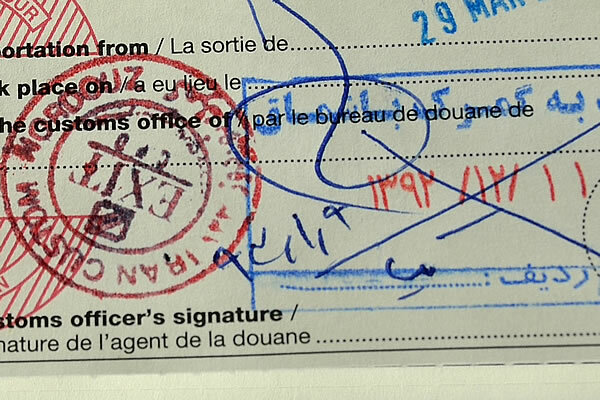 However, we are first directed to a nearby customs office where our Carnet de Passage is stamped. All formalities run extremely smoothly and without even taking a look at our jeep, 'exit' is stamped on the carnet. We get a copy of the stamped carnet de passage which we have to use to pass the next check point. That brings us to a small car park, just behind the passenger terminal building and before the bridge that crosses the border and Aras River to the other side. But first we walk into the passenger hall to get the immigration exit stamps in our passports. But because we enter the passenger hall from the other side, the immigration officer thinks we want to enter Iran and stamps us in the country. Once this mistake is corrected, and we have obtained the necessary exit stamp, we drive over the bridge to the Armenian border. We are extremely relieved that leaving Iran with the car went this easy. First we had the fear that we would have to pay a retrospective tax for the fact that we have been able to buy diesel in Iran for a subsidized price (3.6 Euro cents per litre). 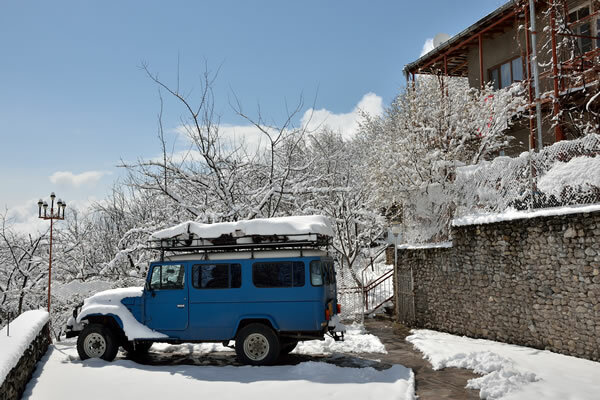 We had read on the internet that some travellers had to pay a hefty tax, based on the number of kilometres they had driven in Iran and the size of their vehicle. Other travellers wrote that they already had to buy a petrol card at the border when they entered the country to offset the low fuel prices in Iran. But we were lucky; we did not have to buy a fuel car when we entered the country (between Iraq and Iran near Marivan), and they did not tax us when we left. Perhaps this has to do with the fact that we have made use of relatively small border crossings entering and leaving Iran. On the other side of the Aras River, we have to stop at the first Armenian military check point. Soldiers take our passports and car papers into a small office, while we wait in the car. This border crossing is extremely quiet. With the exception of a few Iranian cars who want to cross the border, it is empty. After five minutes, the soldier comes back with our documents and tells us to drive to the next checkpoint, 200 meters away. Here we are again received friendly. English is not spoken, but the process is clear: you have to hand over your documents again and a border official disappears in a kind of office container. Next to the office container is a sign in English which states that all border formalities are free of charge. If border officials ask money (read: bribes), the sign tells you to call the border manager, whose telephone number is mentioned on the sign. So, the first steps to reduce corruption have also reached this remote border crossing. Our Land Cruiser 40-series from 1984 draws a lot of attention from border officials who have nothing to do then hanging around the jeep. Although we do not speak a common language, they still manage to ask a wide range of questions about the car by using sign language. What is the value of the car? How much horsepower does it have? Is it a diesel version? Can you open the hood so we can see the engine? The men have a tough and somewhat gruff appearance but are very friendly. After twenty minutes, one of the officials comes back with our documents and we shake hands before we have to drive another 200 meters to the next post, a large building in which immigration and customs is located. We have already received a stamp in our passports in the office container, so the actual immigration officer is only studying our passports very carefully. What we notice immediately is that some immigration officials have a Russian flag on their uniforms. They have special interest in the two Russian visas in our passports (one of which is not used yet). After some discussion with each other, they decide to scan both of them. What the exact reason is why Russian border guards are involved at this Armenian border crossing is still not entirely clear to us. Perhaps it has something to do with the customs treaty that was agreed between Russia and Armenia some time ago. It is also possible that Russia has agreed with Armenia to help them to keep terrorists (from Afghanistan or Pakistan) out. We are happy to notice that we do not have to buy a visa anymore. 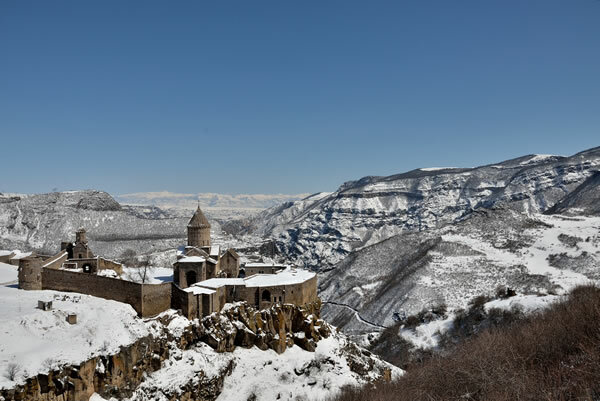 Travellers from the EU can travel to Armenia visa free nowadays. 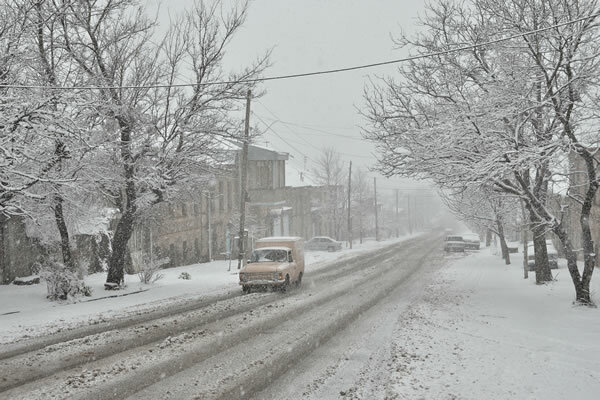 After the immigration post, we are directed to a ticket window where we pay 33000 Armenian Dram (about 58 Euro) road tax for using the Armenian roads (the amount is for a period of 30 days). After we have received the necessary documents with stamps, one last step is left: checking the contents of the car. This seems to be the responsibility of a man in a military uniform. He summons us to open different boxes in our car and show him the contents. Then we are distracted by other officers who again, have a lot of interest in our Land Cruiser. However, the military guy who is checking the vehicle is not distracted and continues his job fanatically. At one point, we only see a pair of army boots coming out of the car. A few minutes later he found our binoculars which we use for bird watching and looks into the mountains with it. He has also special interest in our professional looking camera tripod. He undoubtedly thinks that it would be a good tripod for his Kalashnikov. But the atmosphere is relaxed, and after half an hour, he has seen it all. The last stamp is put on some documents and that means that we finally enter Armenia. If we want to leave the customs area, we need to bring one more visit to an office container: an insurance company. We are obliged to buy a car insurance for 8000 Dram (Euro 14), which covers us for 21 days, for what it may be worth. The policy that we get is almost unreadable because the print cartridge is empty. If we point this out to the insurance person, we get the answer that we have heard already many times before during our travels to the former Soviet Union republics, and that we are undoubtedly to hear many more times in the coming months: "No problem".